As the saying goes, March comes in like a lion and goes out like a lamb. Well it certainly has roared its arrival this past week along the east coast! Spring is here and is starting to look beautiful with new budding trees and blooming bulbs which means it’s time to add a few fresh touches to my home. 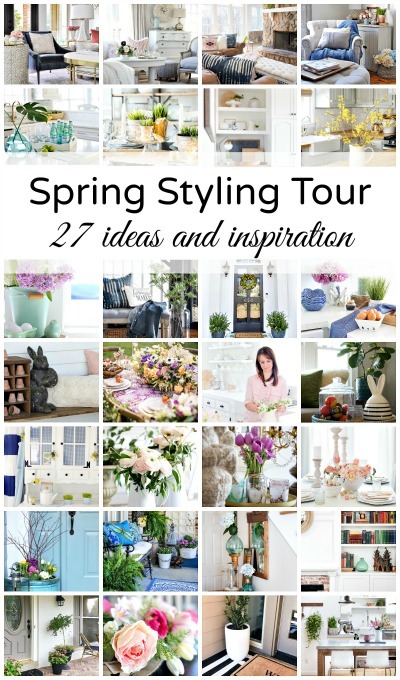 I’m joining some friends this week for the Simple Spring Styling Tour hosted by my friend Jennifer of Town and Country Living. 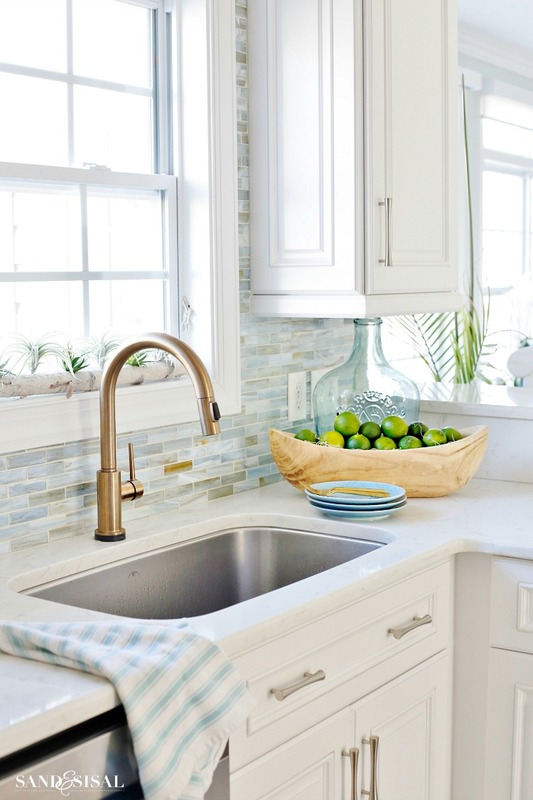 Today I’m sharing a few of my Coastal Kitchen Decorating Ideas for Spring. 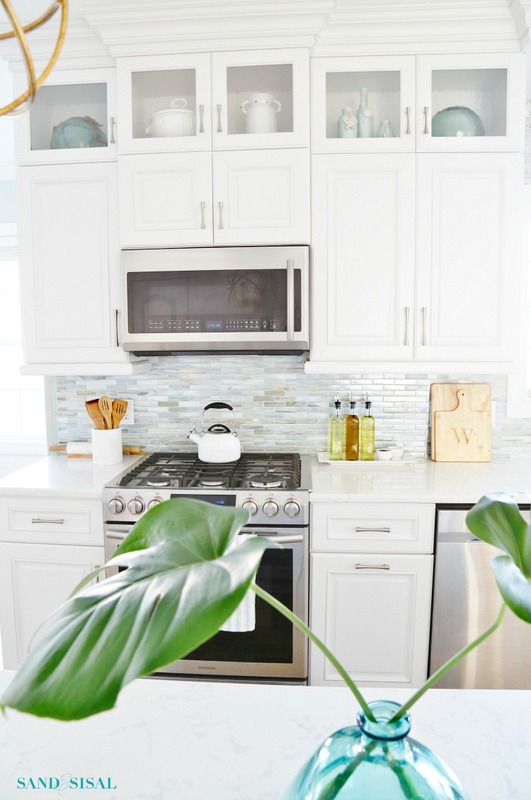 Be sure to scroll down the page to see all the spring styling tips and ideas the bloggers are sharing for specific rooms in your home! Do you decorate you kitchen for each season? For the month of March and April we go green! 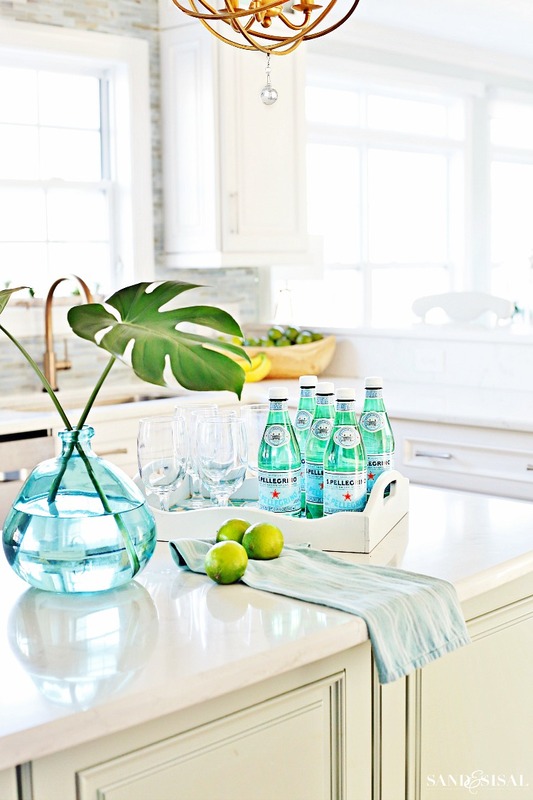 I try to keep the focus for spring more on simplicity, minimalism, with small splashes of aqua and lime in accessories, fresh citrus and lush greenery. Most of all I am honestly just trying to keep it clean! My kids tell me that I have a tropical houseplant obsession. For whatever reason, I can’t pass up a bargain on any tropical plant. Maybe they remind me of summer and anything that puts me in a summer-state-of-mind is a positive thing! Regardless, they clean and purify the stuffy winter indoor air and make me happy. Be sure to check out my post: 10 Top Houseplants that Clean the Air to learn which houseplants are best for your home. The best thing about decorating with houseplants for spring is that they are usually easy to maintain and won’t die in a week like cut flowers. A few philodendron stems, like the one on my island in the aqua bottle, will last for nearly a month! This pothos has exploded in growth these past few months and loves receiving some TLC! Time to give the houseplants a shower! Each week, on Mondays to be precise, I water all the plants in my house. I have found that keeping a consistent schedule works best for both the plants and me! About once a month though I will bring the plants into the kitchen or my master bathroom shower for a leaf rinsing. Since most indoor plants are usually tropical in nature, they thrive on humidity. Rinsing the dust and dirt off the leaves is so good for them. It allows them to breathe better and produce chlorophyl more easily. It also helps with washing away any mites or little critters that might be invading your plants. A quick rinse off is all it takes and then I allow the leaves to air dry. Besides decorating with houseplants, switching out accessories is one of the easiest things you can do. I try to keep the color palette narrowed down to 2 or 3 colors tops. 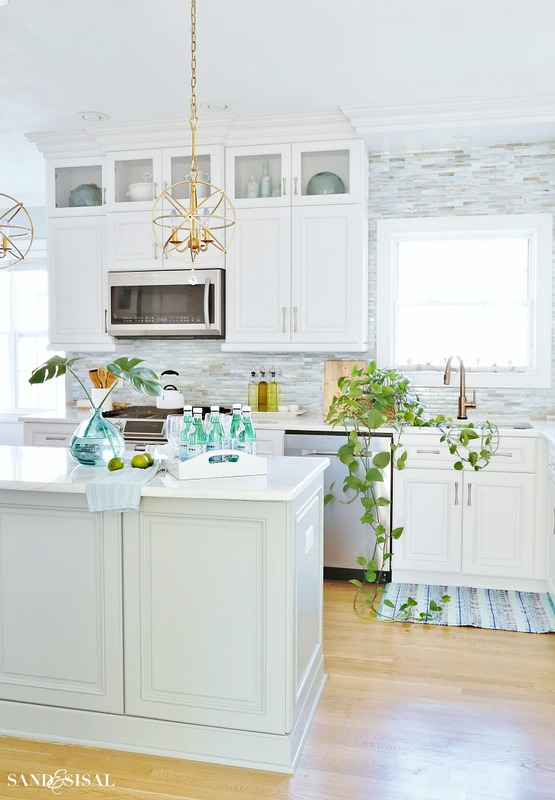 So for our glass cabinets I took down most of the white dishware and replaced them with more coastal themed accessories in shades of aqua, turquoise and lime. I added a cute fish platter, two vintage, giant, green glass floats and an aqua bud vase collection. This works great too if you have open shelving in your kitchen. I added a bright and cheery throw rug at the sink. I’m on the lookout for a long runner which would work better but the little rug is fine for now. 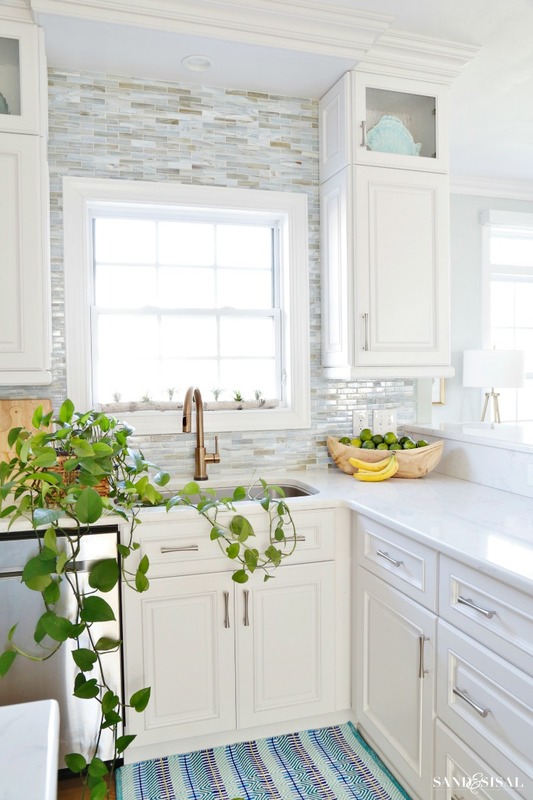 An all white kitchen can look a bit sterile at times so I like to bring a bit of warmth to the space with natural wood like in bowls and cutting boards. 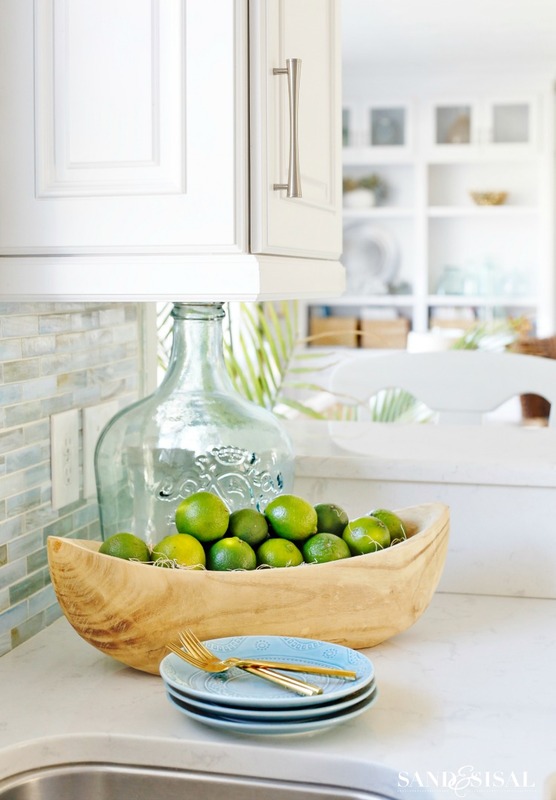 I pulled this carved wood boat from the family room and filled it with juicy limes. The kitchen is fresh and clean and coordinates perfectly with the Easter tablesetting in our kitchen dining area. Click HERE to see closeups of that tablesetting, get more spring decorating ideas and learn how to fold those cute bunny and easter egg napkins. 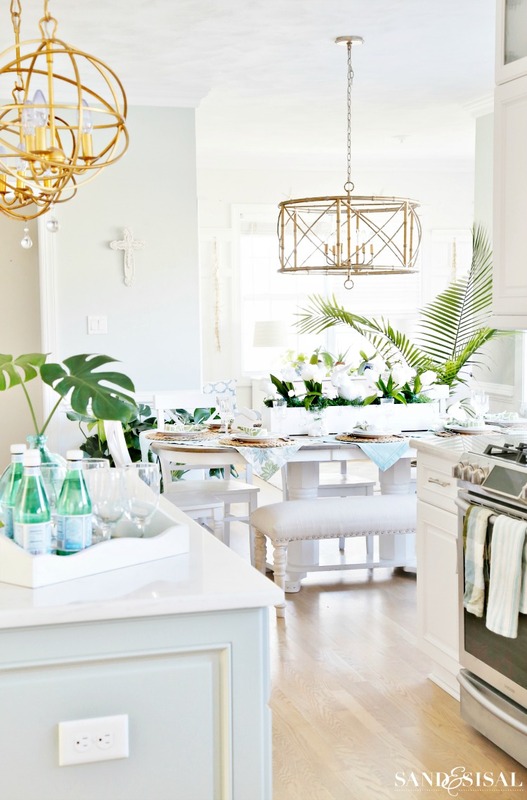 I hope you enjoyed my simple coastal kitchen decorating ideas for spring! Check out all the room decor ideas below! Your kitchen has to be one of my favorites! The fresh style you have is gorgeous. Everything looks perfect and cheery, love it! Thank you so much Amanda! That is so sweet of you to say! kim your kitchen is gorgeous. i’m glad you mentioned the tip about the fruit. i thought you really needed all those limes for your margaritas! OMG – that pothos is crazy healthy! Your kitchen is so pretty. 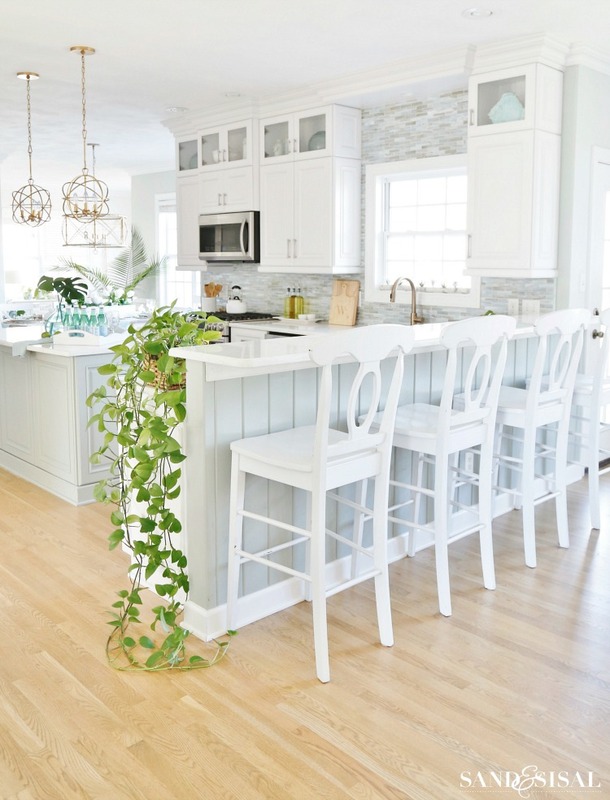 I love the light fixture over your table and the two pendants over the island too. Lights really make a difference in a room and you’ve got a great eye for them. Thanks so much for being on the spring tour! OH! I just LOVE your kitchen, Kim. The colour scheme, the light fixtures, all the details and your beautiful springy touches – so perfect!! You are oh so flattering Susan! Thank you! I’m so happy to hear my kitchen inspired you! Please send me pics when your cottage kitchen is done. I’d love to see them! 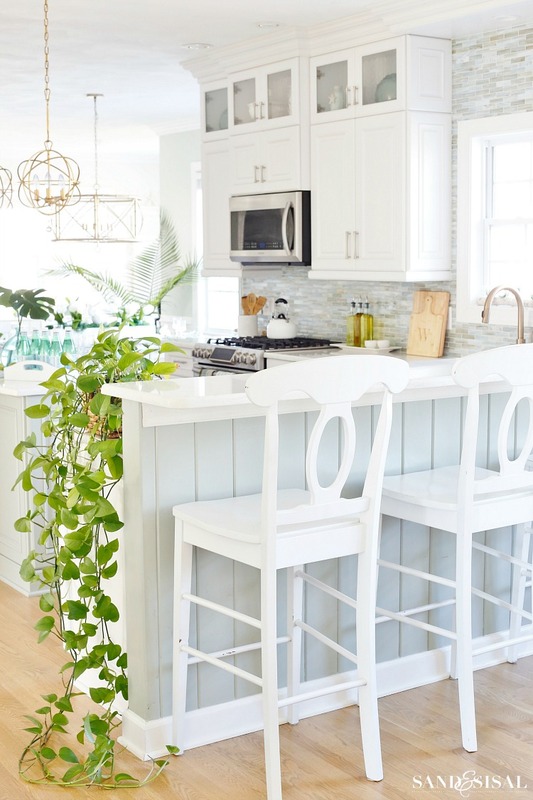 I loved the way you have explained the coastal kitchen decorating tricks! You have explained it nicely. I am thinking to buy houseplants! Thanks for sharing the tips! 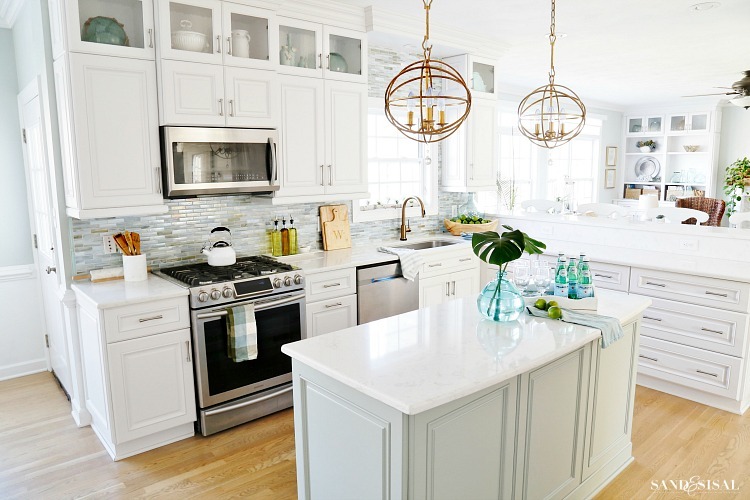 Your kitchen is so stunning! I love how bright, open, airy, fresh, clean and cozy it all is! These are fantastic ideas, I love how you decorate with “natural” elements, those are my favorite to decorate with and they always work so well when it comes to beach decorating! Thank you for the wonderful post, I will for sure be trying these out! Love these ideas! I am totally inspired by your work. I want implement these ideas to decorate my kitchen. Thanks and keep sharing. Love your Spring décor! So bright and cheerful! Thank you so much for sharing these beautiful ideas.